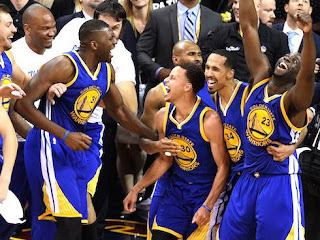 The warriors want to gild the bridge again. The absolute kings of the National Basketball Association (NBA) in the last 3 years despite having lost one of the crowns played with the Cavaliers, remain at the top of the NBA. The Golden State Warriors seem unbeatable. The absence of Stephen Curry made many analysts think that at least this year their thirst for victory would be slowed and that the Spurs would give a few spurs to the Warriors; however, it did not happen. The Warriors are still struggling to regain the NBA title. Now, the Pelicans that swept the Trail Blazers get in their way. What will happen without Curry? The Golden State have already won in the first confrontation with the Pelicans. Nevertheless, for many Californian fans, uncertainty still remains as their star Stephen Curry has had to settle watching the action of his teammates from the bench. The three-point line bomber, after suffering a second-degree sprain in the collateral medial ligament of the left knee, has been forced to only support his teammates with cheers. The injury was for most fans like being bathed with a jug of iced water that froze their dreams of the Golden State win another championship. Yet, the Warriors have not stopped. They play at full steam and with the spirit that has characterized them. Their other field generals push the team forward. Kevin Durant, Klay Thompson and Draymond Green have covered all flanks and led the offense against the Spurs moving to the second phase and continue their advance. To safeguard the crown is the mission that falls on Durant, Thompson and Green. Golden State Warriors’ coach Steve Kerr has already warned: "I know the guys, I know how competitive talented they are, so I think things will change for us in the playoffs”, and he has not got wrong about it. Before the playoffs’ start, several sportscasters thought that the Warriors would perish in the war that was coming against the Spurs. A run of 10 defeats during the last 17 matches augured the worst of the regrets, but no. During the first game against the San Antonio team, the Warriors got a score of 113 to 92, which encouraged the fans and intimidated its rivals; they could only split the spurs to the Warriors once. However, and it must be admitted, those of San Antonio did not have their best players. Their great star, Kawhi Leonard, remained absent as in almost the entire season. Meanwhile, LaMarcus Aldridge was tied all the time by his rivals who defended brilliantly the court. Even the experienced Pau Gasol and Manu Ginobilis had “shinning” moments when they were "liberated" by the warriors. The Spurs could not do much in front of the strongest aspirants to the crown. The 4 to 1 series positioned the Warriors in Conference semifinals and consolidated confidence in the other stars of the team: Durant, Green and Thompson. But the Pelicans, they are something else. A quick flight and accurate shots will be the strengths that the Californians will have to face. Pelican star Anthony Davis swept the Trail Blazers, crushing the New Orleans 4 to 0. If Curry returns or not to the field to support his teammates against the Pelicans, the Golden State should continue the defensive work that was effective against the Spurs and during the first game with the Pelicans when Anthony Davis was stopped in 21 points, 10 in the first quarter, and 10 rebounds. He also failed 11 of the 20 shots he performed. The Warriors have a vertical game and with the possible arrival of Curry, in the coming days, shots from the three-point line may increase. However, Kevin Durant has been the guide of the Golden State’s attacks and continues giving the best of him as one of the highest scorers. On the other hand, Green commands all sectors inside the Californian team. Durant's inspirational shooting and the physical power of Green will be decisive in the new confrontation against the Pelicans, who were the revelation of the Playoff to crush down the Trail Blazers. Although Curry is on the bench, the inspiration of the Warriors continues to mark the meetings and its overwhelming offensive was shown in this first match with the Pelicans that ended 123 to 101. However, the series has just begun and only the best of the seven games to be played will pass to the Conference final that will surely have the Rockets as rivals, a very difficult contender for both Warriors and Pelicans. The Harden beard continues to "delight" and if the Warriors get to it, Curry will be an essential component to contain the Houston. We must wait for the final to know if Curry and his warriors will cover with gold the bridge or if the Pelicans and Rockets will make impossible the new golden dream of the Californians.